After a 7 to C migration project, I wanted an automated way to find out how many of the NFS clients we’d brought across from 7-Mode are actually now dead (NFS clients that have been demised and should have been been tidied up on the 7-Mode system.) 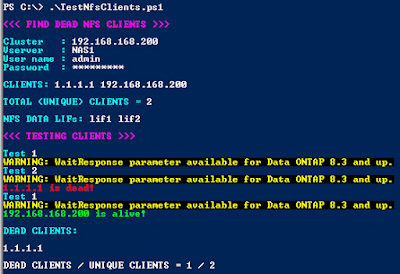 So, I created this tool which gets the list of unique NFS clients on the cDOT clusters, then goes through the list pinging them from an NFS data LIF on the cDOT SVM to test connectivity. It will try up to 3 data LIFs before returning the NFS client as being dead. 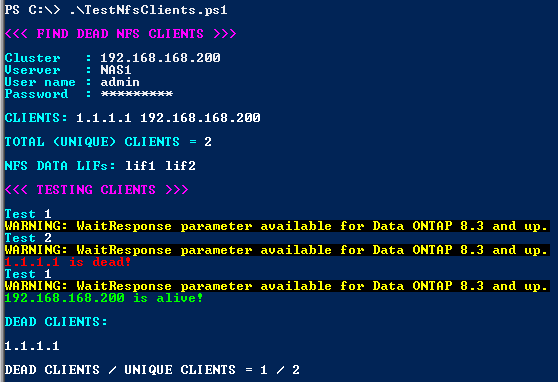 Save as say TestNfsClients.ps1 and run in PowerShell as .\TestNfsClients.ps1.